Texas scientists found that injecting waste water into an aquifer more than 7000 feet beneath the town of Azle, TX, reactivated ancient faults (thick black lines) and caused earthquakes. 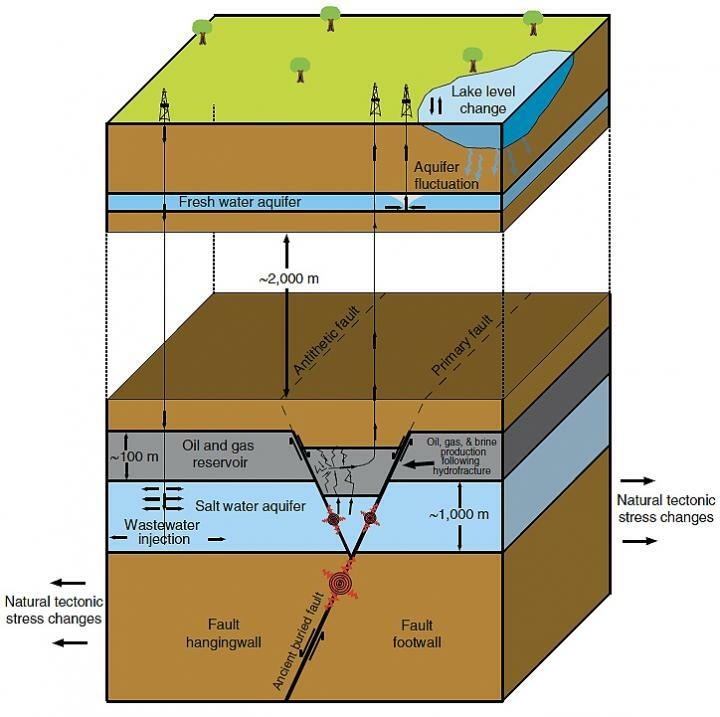 As seismologists, we are often asked if fracking, the brute force technology for the advanced recovery of hydrocarbons and geothermal energy from underground reservoirs, causes earthquakes. The answer is a clear yes, because, simply put, fracking is the very definition of an earthquake. The sole purpose of fracking is to break the rock underground, so that fluids and gases can flow more easily. It is this rock breaking, which in Earth science is commonly defined as an earthquake. There are, however, many major differences between a frack quake and the kind of temblors we are experiencing here in California all the time. Given the tectonic situation in this state, most of our quakes are of a sort called shear fractures. In such a quake the two flanks of a fault rumble past each other, but they do not move away from each other. In contrast, in a frack quake the two flanks of a fault become separated and show only minimal sliding or shear movement. Such quakes, which not only occur during fracking but also when magma rises in a volcano, are called tensional fractures. Given the differences of physical movement in a fault, tensional fractures are a separate class of earthquakes from shear fractures. The other major difference between fracks and tectonic quakes are the forces involved. While it looks impressive and sounds deafening when huge pumps and compressors are moved to a drill site and begin pumping water into a borehole, the pressures they generate are tiny compared to what our own Earth is capable of when the tectonic plates shift. It is for a good reason that the power of tectonic earthquakes is often compared to the energy released in the detonation of a nuclear weapons. You can bring all the pump trucks of the western hemisphere to a drill site and even if they could access the bore hole simultaneously, they would not be able to generate enough force to cause even a medium sized shaker. Bill Ellsworth, a seismologist at the USGS office in Menlo Park summarized in the journal "Science" in 2013: "More than 100,000 wells have been subjected to fracking in recent years, and the largest induced earthquake was magnitude 3.6, which is too small to pose a serious risk." The bottom line: Frack quakes are small and only very few of them are even felt by humans. Why is it then that fracking - or hydraulic fracturing as it is technically called - has such a bad reputation? While the blogger can't comment on how fracking could affect groundwater quality, one thing is clear: There won't be any man made frack quakes which will rock the whole planet like the megaquakes we have had during the past few years. Nevertheless, there is an important aftermath of fracking, which can cause sizable earthquakes. It has to do with the thousands of gallons of water used during the fracturing process. This water contains additives to help the fracking and while underground, it also dissolves minerals from the deep rock formations - in short this water is contaminated. Hence it cannot simply be discharged into a river, used as irrigation water or even sent to a sewage treatment plant. Instead this water is pumped back into the ground, deep below the groundwater horizons. This process is called injection and has been a regulator approved standard operating procedure in the oil and gas industry for decades. According to some sources, there are more than 500,000 such injection wells in the US. Most of them cause no problems at all, but a few dozen of them are associated with significant earthquakes. Here a two examples: The largest quake ever measured in Oklahoma, a 5.6 shaker which struck 40 miles east of Oklahoma City in 2011, was caused by waste water injection. Yesterday, a group of researchers led by Matthew Hornbach from the Earth Science Department of the Southern Methodist University (SMU) in Dallas, TX, published a study about the seismicity in their own neighborhood. They write in the journal "Nature Communications" that a series of small quakes near the town of Azle, northwest of Dallas-Fort Worth, was clearly caused by wastewater injection.